Mobile gaming – games for smartphones and mobile devices – are growing in popularity, and with thousands of games available for free, it’s not hard to see why. Sports, racing, and puzzle games are just a few of the popular genres, but now there is a game with a new and perhaps unexpected set of characters – professional cleaners. ISSA, the worldwide cleaning industry association, has developed and released its own game called Angry Janitors. A take on the super-popular Angry Birds, Angry Janitors puts the player in charge of a cast of cleaning characters, Sweepy, Squirt and Speedster, with the goal of fighting germs and bacteria in a few different arenas, including a school, office, and hospital. The game is not just full of fun, it has plenty of education as well. After each level, the player is presented facts and tips on the value of proper cleaning. 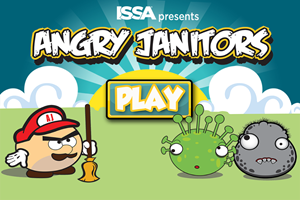 “While Angry Janitors is intended to be entertaining for players of all ages, the game also helps to change the way the world views cleaning by promoting the importance of clean and healthy environments and the crucial role that cleaning professionals play in facilities worldwide,” ISSA Web Communications Director Jon Adkins said in a press release. Another unique facet of the game is that, instead of gold coins, high scores for each level are awarded with golden plungers. Quite the interesting prize if I do say so myself. The game is exceptionally enjoyable and quite addictive. After a few minutes of playing, I found myself getting more and more entrenched in the game. It’s good to see ISSA making a fun way to teach the importance of health and cleaning. The game is available on iPhone, iPad and Android devices. Download it in the iTunes App Store, Google Play, or at www.issa.com/angry.